"To be or not to be" has a vastly different meaning for kids today than what Shakespeare intended when he coined the phrase. "To be" is to have a cellphone and "not to be" is to not have one, and thus be completely disconnected from the world. The decision regarding at what age to allow a child to have a mobile phone is a personal one for each family and is a topic that is widely discussed. The purpose of this post is to make you aware some of the existing capabilities associated with mobile devices, and their implications on kids daily lives. The decision whether or not to let a child have a phone is only the beginning. What capabilities you will allow the child to use is no less of an important decision. In Kids Go Mobile - Part 2 I will discuss some of the newer technologies beginning to appear. For a start I will group the different types of functionality offered to make the discussion a little simpler. Red indicates that the functionality requires an active data connection which is optional in most 2G phones and is included with most 3G phone plans. The functionality I have listed here is readily available by all providers. For capabilities such as video conferencing and IPTV a 3G (third generation) handset is required. 3G means that a higher bandwidth is supported, enabling applications requiring high volumes of data. OK, so what does all this mean? It means that as parents we need to decide the purpose of the phone. If it's sole purpose is to be able to call in an emergency and for us to be able to contact the child, then nothing more than the simplist voice capabilities are required. Some operators are even beginning to market phones for very young children as is described in this Mobile Phone Blog post. Strollerderby also has some interesting insight into this issue. 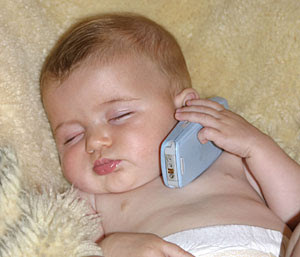 OK, so you have decided your 4 month old can have a phone limitted to voice functionality only. Fine, but now she has gotten a little older and all her friends have phones with cameras, fancy ringtones, and the phone is without a doubt a status symbol. What now??? The data connection and camera are two key decisions. Even if there is a camera, without a data connection sending pictures and videos to friends (and enemies) becomes much more complicated. The only way they can send something is by connecting the phone to a computer or by sending from phone to phone by infrared or bluetooth (both technologies requiring close proximity). While it doesn't prevent sharing completely it makes it much less trivial, and I have found that they don't bother. Eliminating the data connection also means no astronomical bills from downloading content (ringtones, music, games, etc). Whatever decision is made about the data connection, a serious discussion about responsible use of the camera is in order. My children were taught that pictures are to be taken only of fully clothed people and only of people who consent to having their picture taken. No candid camera or using it for surveillance. Like most things, the cellphone can be an aid or a weapon and it is our responsibility to teach our children to use it correctly. As camera quality increases in mobile devices scanners may become obsolete according to this Newsweek article. In a few more years perhaps kids will be using their camera phone to copy from the board in school and convert to Word and PDF files.